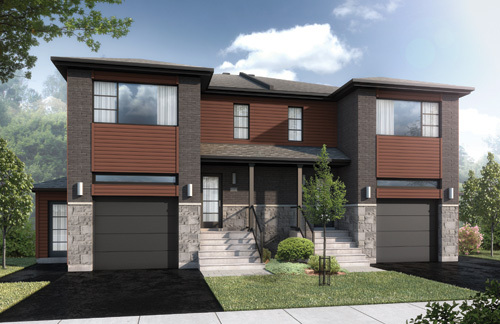 The Chrome 2.5 semi-detached model is a variation of the highly popular contemporary townhome model. This contemporary townhouse inspired by urban-style living is designed for young couples and families looking for the perfect 3 bedroom home with an investment property. Featuring a spacious 3 bedroom upper unit and a beautiful 1 bedroom unit downstairs, this model offers the versatility for young families to live upstairs and collect additional rental income from the lower unit to offset a portion of the monthly mortgage payments. The primary, upper unit offers beautiful living areas such as a spacious master bedroom, stylish bathroom, open concept modern kitchen with cabinets to the ceiling and convenient laundry area upstairs, this townhouse model is the consistent top choice for most of our new home buyers looking for a 3 bedroom option with an attached rental property. Whether it is rented to a tenant, used as parental in-law suite or used by another member of the family, the units are totally independent from each other by having their own separate civic addresses, entrances, parking, utilities and living spaces.